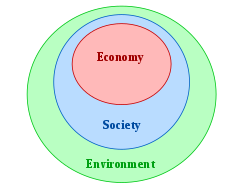 A diagram indicating the relationship between the three pillars of sustainability, in which both economy and society are constrained by environmental limits. In ecology, sustainability is how biological systems remain diverse and productive. Long-lived and healthy wetlands and forests are examples of sustainable biological systems. In more general terms, sustainability is the endurance of systems and processes. These, then, are some of the basic principles of ecology—interdependence, recycling, partnership, flexibiility, diversity, and, as a consequence of all those, sustainability. ...the survival of humanity will depend on our ecological literacy, on our ability to understand these principles of ecology and live accordingly. What scares me? The way the world is going. People seem to think that development is more important than sustainability. To find our steady state and solve the sustainability puzzle, we need to abandon the relentless quest for dominance. We need to abandon our visions of progress as growth... Only progress in diversity, equality, and beauty can stand the test of time. We need to live within our limits. Gordon Pask An Approach to Cybernetics (1961). p. 11. Partly cited in: A.M.E. Salazar, A. Espinosa, J. Walker (2011) A Complexity Approach to Sustainability: Theory and Application. p. 11. Our deep urge to evolve to a more spiritually mature level of understanding and living, and to create a social order that promotes more justice, peace, freedom, health, sanity, prosperity, sustainability, and happiness, absolutely requires us to stop viewing animals as food objects to be consumed and to shift to a plant-based way of eating. Eric Zencey, "Theses on Sustainability" in Orion, May/June 2010.